Rockland High School’s football program is one that has a lot of history and is tied closely to the town and its people. For a few years the program has been lackluster and has found limited success. In the off-season Rockland hired long-time assistant coach, Nicholas Liquori as the new head coach in hopes to spark a new fire under the team. This year Rockland is also led by a talented group of senior captains: Jonathan Barr, Louis Casey, Connor Shea, and Will Breadmore. These veterans and a new coach look to ignite the team and jump start the program. I sat down and spoke with Coach Liquori to ask him about the team. Looking at the skill and heart of the players on the roster this year those goals don’t seem unrealistic. As far as who the team to beat is in the league, Mr. Liquori answered almost immediately with one team already in mind, last year’s league champion, East Bridgewater. The coaches are hopeful and expect nothing less than 110% from the players. No one’s position is set in stone and because of that the players are constantly pushed to perform at their best so they can maintain their positions and playing time. One of the hardest working players on the team is senior captain Louis Casey. Casey plays tackle on both offense and defense, He is the heart of Rockland’s lineman core. With a player’s perspective Casey gave his opinion about the new head coach and the way he is leading the team. Overall, all of the players on the team are eager to prove the doubters wrong. At the time that this paper was put to press the team’s record was 3-1. The Dogs opened the season with a 3-0 win at home against Cohasset, followed by a tough loss against Abington the following week. They then won two in a row, including the huge win against East Bridgewater 25-7 at home on September 24. Jonathan Baar received Player of the Week honors for his three touchdowns in this important league game, but it was the defensive effort of the Dogs that kept EB off the scoreboard for most of the day. Last Friday night the Dogs’ trounced Carver 41-14. Zach Sharland was the scoring leader in Carver with three touchdowns. Mike Ebersole, Dante Vasquez and Connor Shea also scored. The Dogs fell to Norwell but bounced back against Randolph 40-7 on Oct. 13 with a big offensive game. 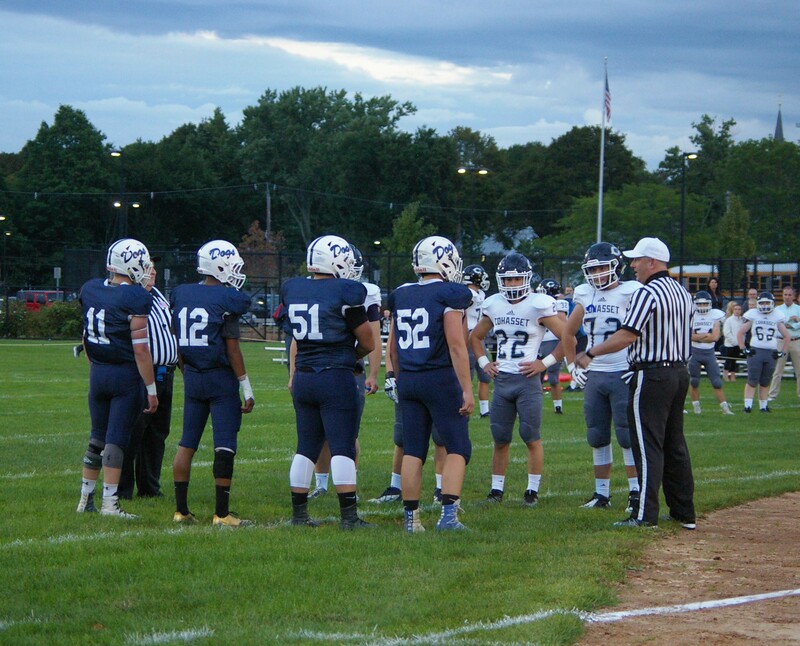 They head into their Homecoming match-up against Middleboro on Friday night with a 4-2 record.